This easy Tom Ka Gai is made even easier with prep chopped and diced Very Lazy Smoked Garlic and Very Lazy Garlic – not forgetting a squeeze of the Very Lazy Lemongrass paste (my new favourite thing in the world). What is Tom Ga Kai? 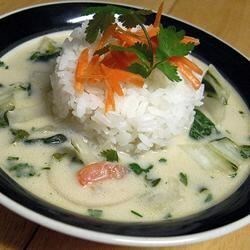 A fragrant and filling Thai soup that can form the base of a chicken, prawn or even mushroom (which I ended up opting for!) dish – what’s even better news, is that you can whip this up in just 45mins! I chose something I could adapt and make within an hour window of getting home. Something that also didn’t have a whole load of ingredients not in my store cupboard. There is nothing worse than after a long day at the office, spending just as long in the kitchen or shopping. Plus, creating a recipe from scratch generally takes me at least double the time once all the chopping is done. I was relieved that this was shortened and the fuss kept to a minimum thanks to the Very Lazy products. I was also lucky enough to be able to use x3 of my goodie bag gifts courtesy of the team after the media event I was invited to. In a large saucepan over medium heat, heat peanut oil. Stir in garlic, ginger, lemon grass, red pepper, coriander and cumin and cook until fragrant, 2 minutes. Stir in mushrooms/chicken and onion and cook, stirring, until chicken is white and onion is translucent, 5 minutes. Stir in sugar snap peas and cook until they begin to wilt, 5 to 10 minutes. Simmer until chicken is thoroughly cooked and flavors are well blended, 30 minutes. Unfortunately I think I needed an extra can of coconut cream as in comparison to this image above, mine ended up looking quite brown – rather than the creamy white soup with flashes of green coriander leaves. This could also be down to the mushrooms that had been boiled down. I’m a terror with slap dashing and guessing measurements so when these things go wrong, I can only imagine it’s because of this! SERVING: This batch easily made two portions and the a leftover for lunch or to freeze. The good news is without useing the chicken, you can reheat the leftover until your heart’s content. DEFINITELY avoid doing this with the pre-frozen prawns unless you want a day out of the office! Posted in food, recipe, seasonalTagged dinner inspiration, dinner party, easy, easy recipes, food, food and drink, inspiration, kitchen, London, recipe, recipes, thai, wanted, what to cookBookmark the permalink.